Some folks who are into shooting videos like using magnifier hoods, but I don't shoot much video. What I have discovered with my NEX 7 however is I have a lot of trouble follow-focusing with this camera when using the viewfinder during high-speed events, such as auto and motorcycle races and air shows. Forget about using the LCD screen for these sorts of activities. It's just too awkward. I think the reason why I have so much trouble follow focusing with the NEX 7, when I don't with any of my SLRs is because of the viewfinder being above and to the left of the optical axis. I dunno why this should matter but it does. So to get around this problem, I can use a mag hood with the LCD screen, which is much closer to the optical axis's centerline. Anyway, after I use a mag hood, I'll know for sure if it helps or not in this regard. And that's why I'm looking at magnifier hoods. I see the high quality magnifier hoods on eBay going for $50 up to $300, and I see incredibly cheap ones selling for as little as $3-something, although ones selling for as much as $10 appear to be the same. I can't help but think the cheap ones are either 1) awful optically or 2) will fall apart after a few hours use or maybe even 3) will be busted right out of the box. No, I don't have any confidence in Chinese-made products, I am sad to report. Not when almost 100% of electronic items I buy that come from China are defective right out of the box. Not when I've seen how crappy the plastic can be on some cheaper Chinese made items. So, given that I can't really afford one of the more expensive magnifier hoods, all this has caused me to ponder the situation and see what might be involved if I build my own magnifier hood for my NEX 7. I've got a fair amount of photo gadgets I've accumulated over the years and, what do you know? I actually have several different items, any one of each that can be turned into a mag hood. I've got some pics showing exactly what I have available and the start of what might be involved in building a mag hood. All of the items, except one, are slide viewers. 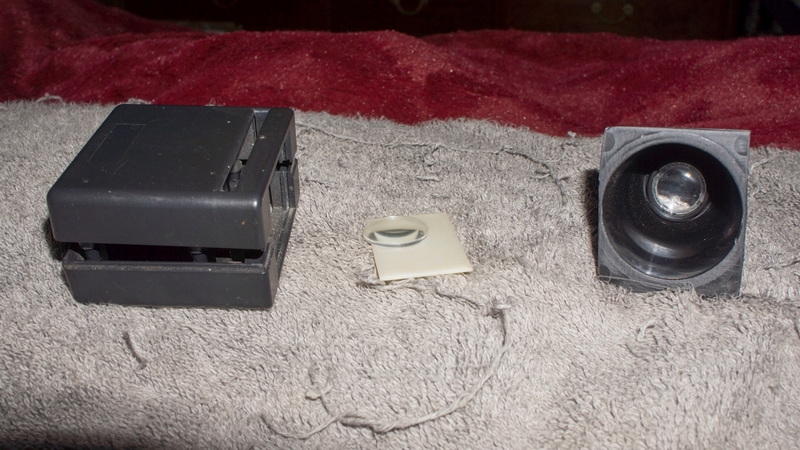 This first photo shows three slide viewers I own that have self-contained lights and batteries. All three work -- they shine a light to illuminate a slide. They all have lenses that magnify the slide's image -- to a greater or lesser degree. 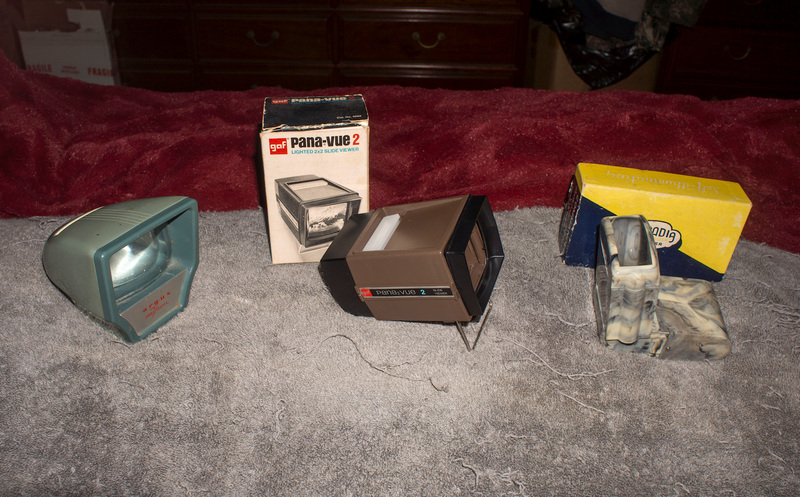 From left to right they are an Argus pre-Viewer, a GAF Pana-Vue 2, and an Arcadia Commander Viewer. It is possible to separate the optical elements from the rest of the viewers on all three. The Argus's viewer comes off when a screw is loosened. This is done mostly to access the batteries. The viewer sits at a slant, which will slightly complicate matters. Actually, the viewer doesn't sit at a slant -- the front surface does. The Arcadia's is easily removable -- it just slips off the front. The Arcadia viewer has a strongly curved surface at one end of the optical element, and a flat surface at the other. You would think there would be a lot more distortion looking through it one way over the other, but there really isn't much difference. Slight distortion either way. The GAF's element sits in a frame that is wedged on to the front, but it's glued into the frame. No worries, it comes out of the frame easily enough. You'll note the lens propped up against the GAF box. I also have two hand-held non-illuminated slide viewers. One I bought at a camera shop about 30 years ago (the rectangular one) and the round one is an advertizing freebie. Businesses used to put their contact info on the viewers and then gave them away. Like match books. Also included in this photo is a Spiratone 150mm bellows lens. While it is not a slide viewer per se, it certainly can be used for one. Ignore all the stuff on the front of the lens. It's just dust and stuff. The lens is perfect. And finally, I've got a shot of both hand viewers partially dismantled. The rectangular viewer can be pryed apart, and the lens removed. With the round one, I had to pop a few glue seems. I also trimmed the ends off the round viewer's flange end. There were raised strips on that flange -- glue joints and two guide rails for the slide. If you look closely you'll see the rectangular viewer's optical element sitting on top of its translucent panel in the middle of the photo. I could have chopped up the rectangular viewer until it approximated the cut up round one, but I just couldn't. I've had that little thing for over 30 years and I just can't bring myself to chopping it up. I show just the element, though, to indicate that it can be mounted into something else. OK, each of these viewers has its strong points and each may require some additional work before they can be mounted in some sort of hood. Take the Argus, for example. That's a large screen -- about 2" x 3" -- it's a big hunk of plexiglass. And it provides a decent image, with some noticeable distortion on the edges, but it isn't too bad. But to use it properly and mount it into a hood, I'd have to cut away that front area such that it was just the element still seated within a rather big hunk of plastic. It's the biggest of all the viewers and it needs about 3" to 4" of eye relief -- meaning from the front edge of the viewer to my NEX's LCD screen, there needs to be somewhere between 3 and 4 inches. So, it would end up making a big magnifier hood. The GAF's element will have to be mounted into something. It can be glued back into its black plastic frame if that might make mounting it easier, but I dunno. This viewer's element is almost as big as the Argus's, but it weighs only a few grams. It's also square and not a rectangle, but its field of view is big enough to cover all of the Sony's LCD screen. This element also will require about 4" of eye relief. Next is the Arcadia viewer. Of all the viewers, this one is the best thought out. Not only can one view slides, but it's also made such that one can view slide or negative strips. I also like that it's designed such that the optical element with its housing can be removed from the viewer completely -- probably so it can be used as a loupe if desired. Because the optical element and its housing can be easily separated, it would behoove me to incorporate this feature into a mag hood design should I choose this viewer. One thing I've noticed about all three of the battery-powered viewers is they are wide enough to provide full coverage of my LCD screen. They also all have similar eye reliefs -- from 3" to 4". I'm measuring this with the viewer held all the way up to my eye, by the way. Now as for the two hand-held viewers, they are closest of all to being ready to use. At least the round one is. I've already trimmed away parts of the flange that I don't need, such that it lies flat aainst the LCD screen. And when placing the viewer up to my eye, held flat against the LCD screen, the screen is in perfect focus. Unfortunately the viewer, becacuse it is round, cuts off the LCD's corners. But it's just the corners. And if I wanted to trim up the viewer some, I could probably include the corners. But just as it sits, it's ready to go. All I need to do with it is figure out how to secure it to the NEX. The way I see it right now, I drill holes in the fur corners and use elastic bands to wrap around the camera. Or I could glue extensions onto the flange and then use miniature clamps to hold the viewer to the camera. I kinda like the clamp idea. I have some mini clamps that would work perfectly. And then last but not least we have the Spiratone 150mm bellows lens. When I hold the back of the lens up to my eye, objects come into focus about 2" in front of the lens. 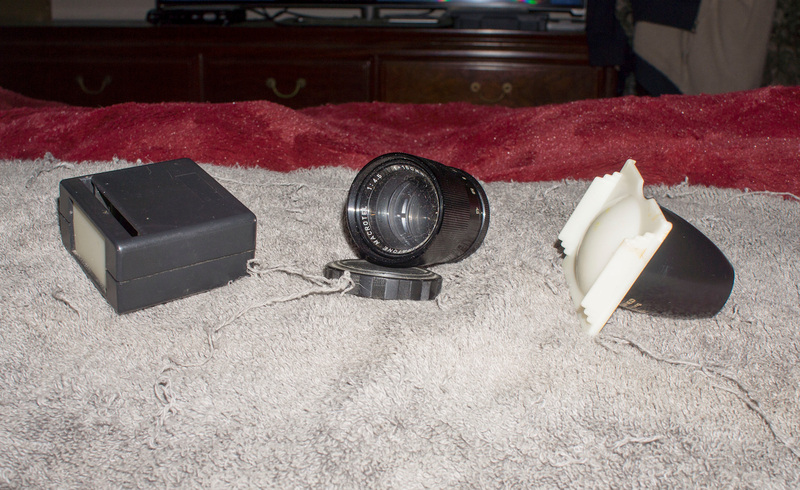 This lens came off a Spiratone bellows with movements made by Hama -- kind of a very collectible bellows nowadays. But I'm assuming it is probably similar to other bellows lenses at least. This particular lens has T-mount thread at the rear, which is unusual because it has no focusing helical. Nonetheless, I can use just the inner threaded portion of a T-mount as a mounting ring, so that I can mount it into a mag hood and wind up with a very effective magnifier. I haven't shown any completed projects -- mostly because I started on this just a few hours ago. But also because I've still got to decide how to proceed. For the body of a mag hood, I can utilize a number of different types of material. There's a plastics shop close to where I live that mostly makes signs, but they always have a scraps bin, which they sell stuff out of for cheap. I can pick up a piece of acrylic or whatever from them, cut it to my needs and then glue the cut pieces to form the body of my mag hood. Spray paint it black and Bob's your uncle. This sort of thing is cut-and-dried and doesn't really even need to be shown. As for mounting it to the camera, I've seen two ways of doing it that are the most practical looking. One is the elastic band approach, where you wrap them around the front of the camera. The other is where you use magnets, which might be harder to source. There's also the approach where you fabricate a double tripod mount. You configure the hood to mount to the camera's tripod mount to secure it into place. But then you add a tripod mount onto this other mount so you don't lose your tripod mount. The easiest way to accomplish this is to have a tripod screw that's hollow with a male thread on one side and a female thread on the other. I think what I'll do is get the round slide viewer finished for sure, and then I'll choose one of the big battery-powered viewers or maybe the Spiratone lens and see how it works out. Pics of the finished piece to follow. If any of you have built your own mag hood, I'd be interested in seeing how you did it. I've seen some interesting videos out on the net, some quite creative I think, but I'm gonna see what I can come up with on my own. Sorry to hear that. My experience with China-made products has been quite different. I've purchased dozens of electronic items from China -- all of them work fine. In fact, they are of very high quality, and, very inexpensive for what they do. For example I put together a 4-ch 100WPC 0.01THD 102dB audio amplifier for less than $50(!). Metal detector, led headlamps, led flashlights, replacement batteries, rechargeable batteries, ozone generators, battery chargers, 2x eyepiece magnifier, mp3 players, msD adapters & more... I even got a msD to CF card adapter for my 5D. will follow with interest Michael.. It's nice to have one available, I used it regularly to fine tune focus in live view for my viv-tamron tests. When I click on the Amazon link, it shows it as being "currently unavailable." Too bad, it looks like an interesting piece to use. I entered "LCD screen 3x" in the search panel over at eBay and got hundreds of hits, although none of the ones I've seen so far have a frame like the one on Amazon. As for mounting it to the camera, I've seen two ways of doing it that are the most practical looking. One is the elastic band approach, where you wrap them around the front of the camera. The other is where you use magnets, which might be harder to source. There's also the approach where you fabricate a double tripod mount. You configure the hood to mount to the camera's tripod mount to secure it into place. But then you add a tripod mount onto this other mount so you don't lose your tripod mount. The easiest way to accomplish this is to have a tripod screw that's hollow with a male thread on one side and a female thread on the other. I think you could use the flash shoe of the Nex-7 as an accessory shoe and mount the magnifier hood on it, as well. 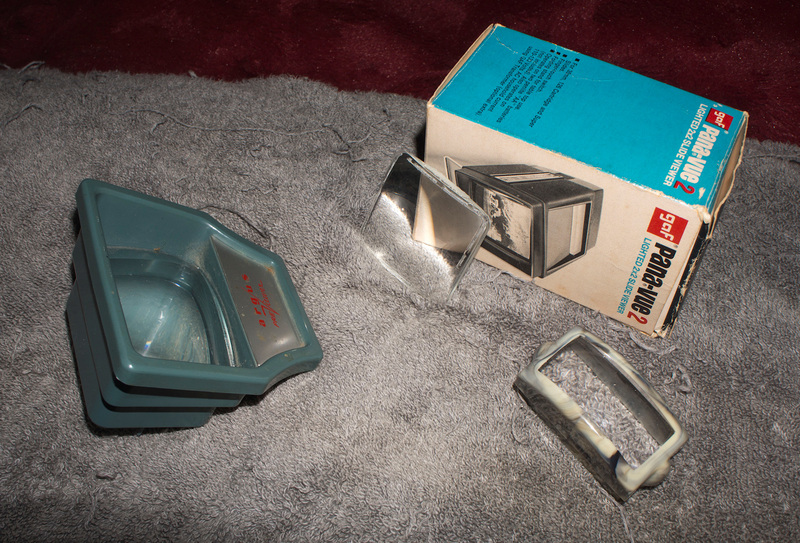 I made once a removable magnifier for the ground glass of my Linhof, but that's a too different situation. What does it say about a camera, if it has such a gadget necessary?? I bought one of these $5 magnifiers, the construction is worse than weak. Also I sometimes like to take images from high or low positions, so no mag. hood helps much. I tried once at home to connect the camera to a PC (Canon have software for that, probably all brands have), but in exteriors it is not much practical. I also tried with small external monitor, still an option, but a good power source is a must. (I adapt everything I use to Sony camcorder batteries 8.4v, chinese versions 8000mAh). The branded are $400-$800 if I remember right, chinese ones one zero less, maybe even $30 is a good price. The last solution is to use my smartphone (any android with wifi). Canon have their own app, DSLR controller is for Canon and Nikon I thinkk, and there are some more not tested. I really do not go this way, while Im focusing MF lens using Magic Lantern´s focus peaking, and this hack does not show on the android´s software, only the original Canon interface do. I really miss the fully articulated LCD of my old Canon SX20... It was a real fun to use.